Bluestone patio, seating walls, tree planters, walkway. 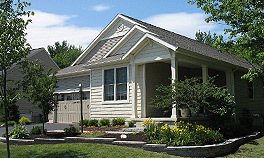 Commercial stonescaping service - Schenectady, New York. 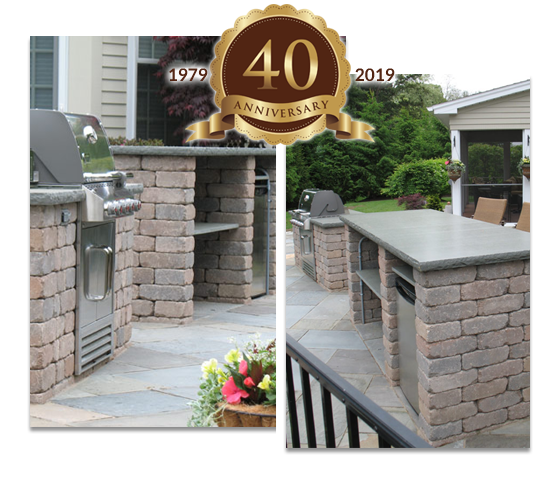 Specializing in new outdoor kitchens! We create comfortable, eye-catching outdoor living spaces that you and your family will enjoy for years to come! 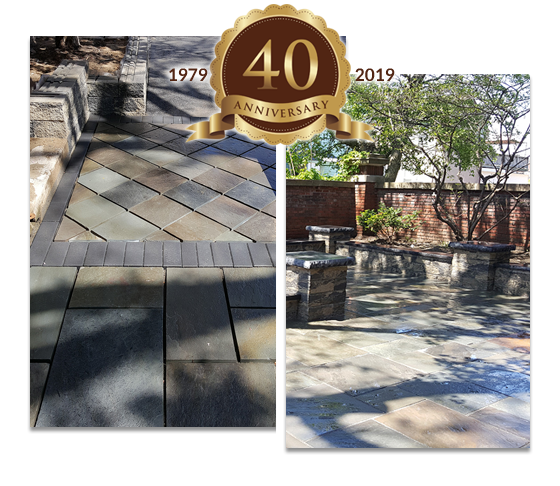 40 Years of Professional and Stonescape and Landscape Design & Installation services for all commercial and residential applications. Full follow-up and maintenance. All work is guaranteed and insured. Thanks for a great job on my front stairs and drainage area. I've already recommended you to other people. It's a pleasure to work with a quality team of people who deliver what they promise. #1 Stonescaping is aces. Dave and his team are great - They Rock! They landscaped both my front and back yards. I love their use of rocks - large pebbles instead of mulch in my back yard and one huge rock in my front. I love my ancient quarried rock. David and his team did an outstanding job on our patio. We needed various repairs and a new fire pit built. Everything came out great. The team was fast, flexible and reasonably priced. I will definitely be recommending them to friends and family! David and his entire team are the most professional and efficient people I have had the privilege of working with to beautify my home. They are prompt, neat, courteous and expert at their craft. I look forward to working with them again to install a back patio. Dave is a man with a professional work ethic and corresponding work crew. I am pleased to say that there still exists craftsmanship in our time. 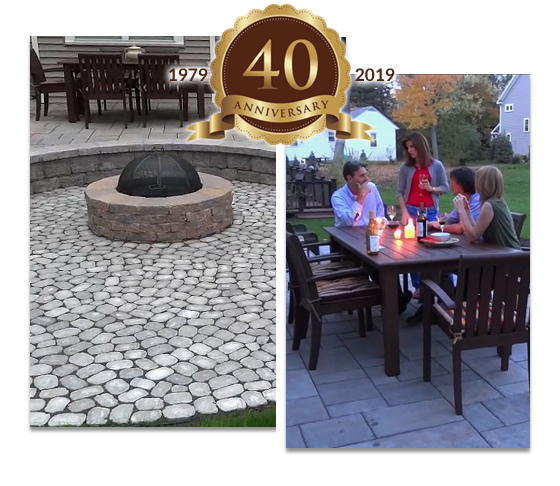 Thank you for creating "curb appeal " to our property and then doubled down with a great rear yard patio. This is the second job I used Dave, first a front porch and then a patio. I am very satisfied with the workmanship and the clean up and would recommend him to anyone. Dave did a fantastic job on our front walkway. Beautiful color stone and beautiful design. Absolutely love the work and highly recommend Dave's company to anyone. He came when he said he was available to start the work and finished before scheduled date. Our stonescape and landscaping project was beautifully designed by Dave and his team. We are thoroughly enjoying the layout and beautiful aesthetic of our patio and walkway! #1 Stonescaping did a beautiful job in laying out and putting in our new patio and walkway. They are craftsmen at their work. We would easily recommend them others. Dave and crew did a superb landscaping job. Dave was also excellent in helping us design the project. We will us them again. We asked Dave to create some gardens that looked different from the others in the neighborhood. Dave listened and worked hard to find plantings that would accomplish this. We are very pleased and looking forward to enjoying the color and textures he put together for us. Dave and his team did an excellent job building our gas fire pit. The pit came out great and his crew were professional. Will definitely use them for any future outdoor space needs. 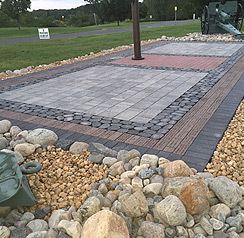 — Jayne S. & Dave W.
"..Dave and his team did an amazing job redesigning the platform around the flagpole and turned it into a show piece on the CBA Campus. It was a pleasure working with Dave, a CBA Alumnus, because he put his heart and soul into the job and created something way beyond our expectations. It will be a source of pride on our campus for years to come."